Though Jenny Robinson is only 31, her resume has a long list of former jobs: invasive species control with the National Park Service, package handler at UPS, engraver at a sign shop, a stint as a machinist and work as a quality auditor and production supervisor for Kraft Foods. Robinson, who lives on Madison’s East Side, began making the unusual musical instrument after she realized the job would demand many of the skills she had developed over the years. Modeled on an instrument invented in 2000 in Switzerland, the handpan is made of two half-shells of metal. The finished product resembles a large double-sided tortoiseshell (or even a small UFO from an early sci-fi movie). And, in fact, the music to come out of a handpan is somewhat otherworldly. The instrument’s top is dimpled with eight or nine different “notes” that are played with the fingertips to create different melodies, rhythms, and acoustic effects. Though easy to play, a high-quality handpan is still rare to find. Each instrument takes months to fabricate out of a flat circle of low-carbon steel. 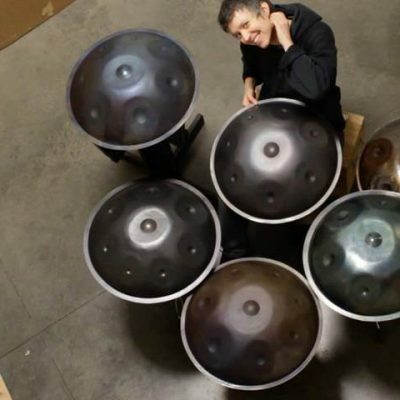 It must be finely shaped, hammered, heated, stretched and tuned to create the handpan’s distinctive sound — somewhat like a harp, a bit like a marimba, a mellower cousin of the steelpan drum. “It has such an ethereal and haunting sound,” said Lori Mankowski Gettle, a Madison radiologist who purchased one of Robinson’s handpans after years of wanting one. Gettle, who went to college on a music scholarship and is a serious oboe and percussion player in her spare time, finds the handpan “so inherently playable. There’s no wrong notes. It can be very relaxing,” she said. To read the entire Wisconsin State Journal article.